The Factory 4.1 RCT incorporates the latest in FMF Resonance Chamber Technology™ both internally and externally. In addition, we achieve a shorter overall length that is less susceptible to crash damage and complementary to our Factory Forward Engineering – moving the muffler closer to the motor to centralize mass. The Factory 4.1 RCT is constructed from only aerospace grade materials that meet our exacting specifications and is manufactured 100% at our Southern California factory. -Massive Power gains throughout the RPM range. 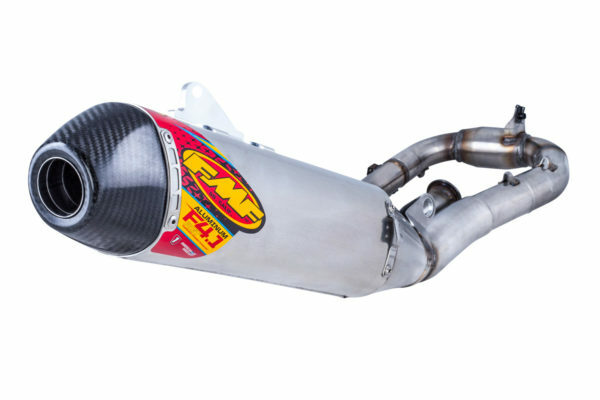 -FMF uses the highest quality proprietary blend stainless steel made especially to our standards.